← QR Fun – After-School Project With My Son! 1) Most of the apps I use are not content-specific to mathematics. 2) Most of the apps I use are because techchef4u Lisa Johnson introduced them to me. 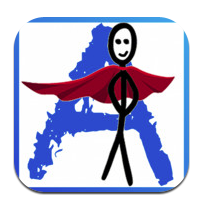 The Animator Free app is no exception! Lisa showed me this app and gave me the inspiration to create cartoons or “flipbooks” for multi-step math topics. 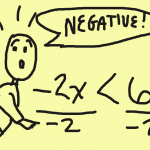 I’ll admit – during my days as a math student, I would make little stick-figure drawings in the bottom-right-hand corner of every page of every notebook. When I needed to entertain myself, I would just flip through the pages and watch my stick-figure do somersaults and all sorts of amazing tricks. How neat that an app can simulate this idea on a grander scale, and cartoons can apply to content! This entry was posted in Algebra 1, Pre-Algebra and tagged Algebra, Animator Free, inequalities, iPad, techchef4u. Bookmark the permalink.